Colson Transport Ltd offer a wide variety of business waste services. Ryan Colson, CEO, is committed to providing ethical and environmentally friendly business waste disposal services to businesses throughout Nottinghamshire, Derbyshire and Leicestershire. With a wide choice of trade waste containers we can provide a solution that meets all of your business waste and recycling needs. Versatile, hygienic and secure enclosed containers that can be scheduled for collection at your convenience and a time to suit your business. Our wheelie bins are a popular choice for compactable waste due to the sizes they are available in and the fact that they are very portable and easy to use. This makes them great for both indoor and outdoor use and they lend themselves really well to places that have limited or complicated access. 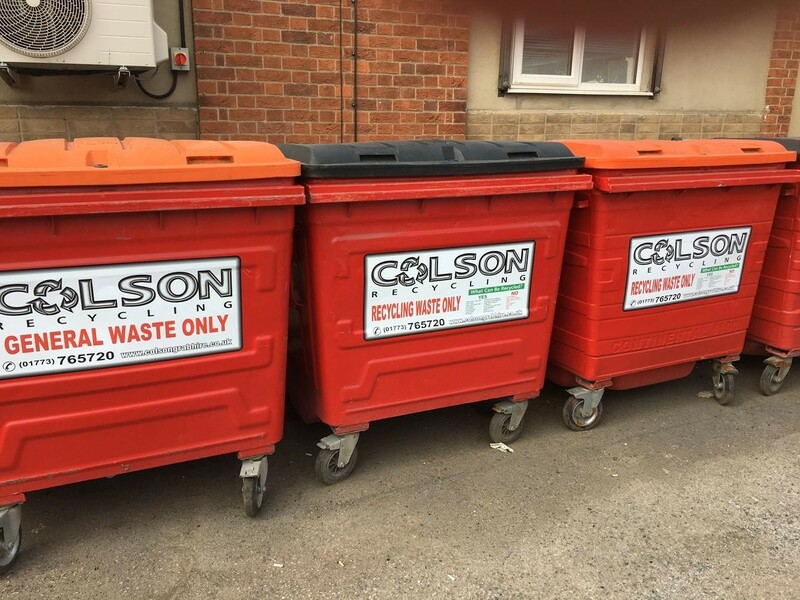 For larger scale business waste management, Colson Transport Ltd offers a full range of larger business waste containers. These include options such as roll-on-roll-off containers, front or rear end loading waste containers & portable or static compaction units. Our compaction units are fantastic for reducing the volume of the waste you want to dispose of. This allows you to fit a larger amount of waste into one container. Consequently, fewer collections are needed for higher volumes of waste. We also have a large range of bins, skips and other containers. With so many possibilities we are bound to have the perfect solution to fit your business waste management needs. We want to support our clients in all their business waste recycling efforts. Colson Transport Ltd make every effort to recycle as much waste as possible. To make this beneficial for our clients as well as the environment, we offer great incentives and discounts to clients who separate recyclable waste. Types of recyclable waste you can separate include: plastic, card, paper, mixed recyclables & timber. Not only will you be supporting the environment, it will demonstrate to your clients that you too are environmentally aware & champions of ethical waste disposal. The more work you do to separate your recyclables, the greater the waste collection costs – so really it’s a win-win situation! For more information about business waste removal in Nottingham, Derby or Leicester visit our website.